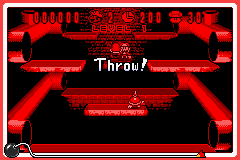 Mario Clash is a microgame found in the Nintendo Classics folder in WarioWare, Inc.: Mega Microgame$! that is based on the Virtual Boy game with the same name. It returns in WarioWare Gold, where it is hosted by 5-Volt. The objective is to throw a Koopa Shell at either Spike Top, Boo, or Para-Goomba depending on the level difficulty. If Mario misses, the player loses the microgame. 1st level difficulty: The enemy is a Spike Top. It walks back and forth and passes through the target spot twice. 2nd level difficulty: The enemy is a Boo. It floats down to the target spot once then floats up. 3rd level difficulty: The enemy is a Para-Goomba. It jumps around, landing on the target spot once for a short period of time. In WarioWare Gold, the Para-Goomba has to be hit twice. This page was last edited on March 8, 2019, at 23:05.